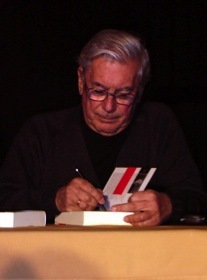 The 2010 Nobel Prize in Literature has been awarded to Peruvian author Mario Vargas Llosa. He was chosen “for his cartography of structures of power and his trenchant images of the individual’s resistance, revolt, and defeat,” according to the Nobel Prize website. Some of his best known novels include The Green House and The War of the End of the World. His Wikipedia entry is full of interesting facts about the author: he married his first cousin with whom he has three children, he punched Gabriel Garcia Marquez for unknown reasons in 1976, and he unsuccessfully ran for the presidency of Peru in 1990. The 74-year-old Vargas Llosa is currently spending the semester teaching at Princeton.